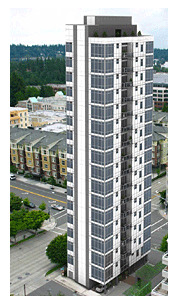 The next stop on our Bellevue tour is European Tower (website) located at 930 109th Ave NE. 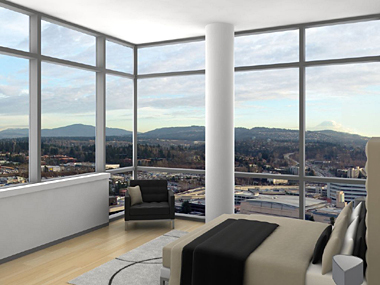 Of all the new condominium projects in Bellevue and Seattle, European Tower is destined to be the most exclusive and distinctive. Developed by Russian-based GIS International Group, the 17-story tower will be home to only 16 chic condominium homes, just one home per floor with a two-level penthouse. 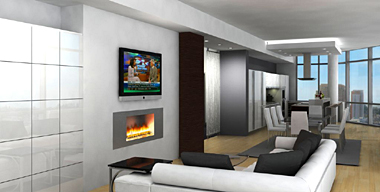 With its European heritage, the developers have created a very modern and sleek residential property. Based on renderings, the home designs are open with clean lines and include stylish imported finishes and European fittings. Each two-bedroom home features a separate den area, 360-degree panoramic views, two decks, two elevators and two spaces in the underground mechanical garage. Residents drive into the secured car port area and the automated garage whisks the vehicle away and stores it in a space underneath the building. Residents will also enjoy memberships at three exclusive Bellevue clubs – The Harbor Club, Pro Sports Club and the Bellevue Club. The property is located just blocks from Bellevue Square, Lincoln Square and the upcoming retail development at Bravern which will include a Neiman-Marcus store. Homes are priced from around $2 million and higher. Please contact us if you’d like to learn more about this project.